You are here: Home>About>Blog>Conservation Works are underway! It’s truly an exciting time as our Conservation works programme is now fully underway with both our contractors onsite. They’ll be onsite all summer and autumn completing various degrees of conservation and in some case restoration of all the blast pens, fuel dump and rifle range. 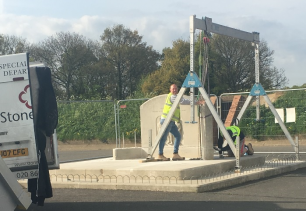 The works once complete will mean the monuments will be taken off the monuments at risk register compiled by Historic England and safe guarded for future generations to learn and engage in Kenley’s significant Battle of Britain history. Work has begun by Stonewest on the dismantling and movement of the RAF Kenley tribute which will move forward in the tribute blast pen. This will then allow us to fully restore the missing spine wall later in the year and once the works are complete it will fully capture how the blast pens functioned during the Battle of Britain. We’ll also be opening up the air raid shelter complete with original graffiti during our events to invoke the spirit of the airfield during a time of war so do come pay us a visit! So how do you move over 10 tonnes of Portland stone? This image captures what is a rather ancient method where an A frame is used to lift the stone by hand pulleys. This makes for delicate work in ensuring the stone is lifted carefully and methodically to prevent any damage. This kind of lever and pulley system has been in use and adapted throughout the ages and notable monuments built in this manner include the famous Angkor Wat temples in Cambodia built in the 12th Century! 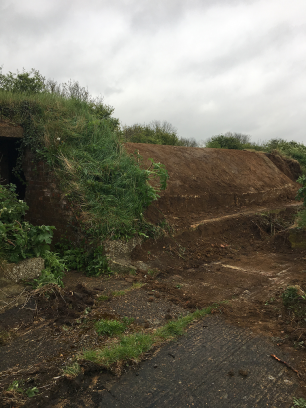 Our second contractor, PAYE will be delivering the conservation and restoration works which are underway in Zone 2 which is the North East end of the airfield including fuel dump and the pen with the intact spine wall which will be the focus of our conservation seminar next year. This spine wall is an exemplar along with the all the monuments in what is termed as ‘Impermanent Architecture’ which showcases how quickly each monument was built as a testament to willpower and the determination in building Britain’s defences during the threat of war. This photo captures the scale of the works ahead where this blast pen will see all of its soil removed to allow repairs to the brick and concrete casing before the original soil is put back on. The original soil is as significant as the brick and concrete itself in terms of conservation because the soil acted as the shock absorber and deflector of any bomb blasts which occurred during attacks. We can also see where the soil was obtained with some pens having bluebells growing on them which shows the soil was taken from the forest behind, again an example of how quickly these structures had to be built and with whatever materials were readily found. We’ll be providing regular updates on the works through our newsletters and online so keep your eyes peeled as it progresses! We’ll also be running Hard Hat tours to get close to the works and explain further the intricacies of Kenley’s defensive architecture, find out more in our newsletter. Would you like to help preserve and protect the most intact fighter airfield from World War II? Then please get in touch for how you can help as part of our dedicated volunteer programme.